Install a dual flush mechanism in your toilets. If you have an older type that you cannot install such mechanism you can place inside the water tank a bottle that contains sand to reduce consumption. When shaving do not let the water running from instead use a small bowl with warm water to clean the razor. Instead of taking baths or long showers take short showers. Moreover, consider buying a low flow shower head that can reduce flow from 50% to 70% and can be as powerful like the conventional ones in its water flow. When brushing your teeth turn the tap off and use a glass for rinsing. Wash your vegetables and fruits in a closed sink or in a bowl of water. When done use the water to water your flowers and plants. Make sure that you fully loaded your washing machine and your dishwasher before pressing the start button. If you are thinking of buying a new washing machine consider buying a front loader which uses up to 40% less water. Note though that they might be difficult to find and they might be more expensive than your typical top loader. Don’t use a hose for watering your plants and flowers instead use a watering can. Perform occasional checks on your household appliances that use water to make sure they don’t have a leak. 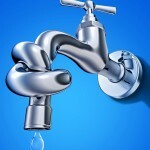 Many of these silent leaks not only waste water but can be costly.